Can you spot the pest? Some insects have such good camouflage it's hard to spot them! 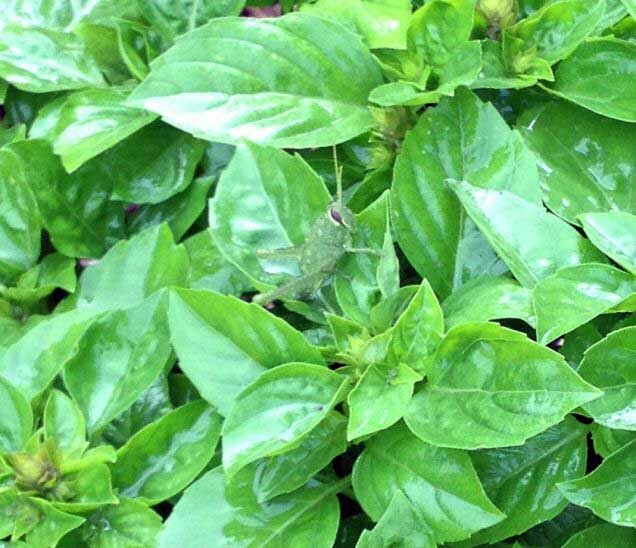 This green grasshopper has taken up residence on a basil plant. Grasshoppers can cause huge amounts of damage to crops and home landscapes. Grasshoppers are chewing insects and will feed on the foliage and flowers of many different plants. Grasshoppers go through several instars (stages of development) before they reach maturity. Organic control of grasshoppers is most effetive when they are treated within the first couple of instars, when they are still small. Once grasshoppers are large they can be very difficult to kill, even with chemical pesticides.